This is a Beta preview only. 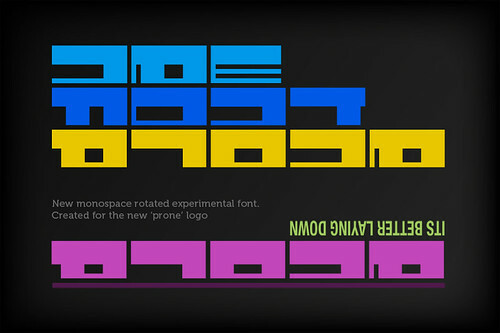 Whilst creating a new logo, I came up with a mad idea to create a new ‘font’. First time I have ever done so and frankly, I feel lame even calling it a font because it’s far far FAAAAAR from being one. A font that is. The logo name is called Prone, so taking the prone meaning literally, I decided to play around with some pretty shapes to create a custom and truly unique and utterly experimental ‘font’ or better yet, mixture of odd shapes. Initially, I only needed the characters to make the word Prone for this new logo. As prone generally means laying down, face down, such as doing press-ups, the font is rotated 90 degrees to reflect this meaning. Each character is the same width and height and share common characteristics where possible. Easy enough when you only have a few characters to create, but now becoming more tricky with the entire alphabet. But I am making progress, so I will release more character previews as and when I am happy with them. I am under no illusion about how complex and time consuming, how truly dedicated and talented one must be to create a true usable commercial typeface. Creating Prone is in no way meant to cheapen the skill and expertise of professional fontographers etc. Messing around with Prone is giving me an even deeper acknowledgment and appreciation of what it takes to create a commercial typeface. As I said above, I use the word ‘font’ in it’s most loosest definition. It is far from being a font.